A lot of things can happen at a drop of a hat so it’s not unusual to have emergency meetings in the workplace. Critical issues can suddenly appear, making it crucial to hold a meeting. Usually, with traditional meetings, this requires a reserved venue and physically gathering the necessary participants. However, doing so takes longer so it might take you several hours to accomplish these, instead of spending just an hour for the discussion. In order to prevent this from happening, virtual meetings can be utilized so participants can share data in real-time, resulting to quicker decision-making. Virtual meetings can be used to connect with clients residing in a different country as long as they have the necessary equipment. In regards to conferencing, some conference call services offer international long-distance numbers so they can easily join the live call. Companies sometimes find it difficult to relay specific instructions to all their employees, especially with their remote employees due to distance or difference in time-zones. Fortunately, with virtual meetings, relaying your directions to everyone at once is made possible. Collaboration between employees from different departments, more so if they’re from different branches, can be difficult since they would have to find a schedule that works for both parties. Thanks to virtual meetings, this time-constrained problem can be lessened while also allowing all interested parties to interact with each other as well as hold brief meetings about future plans and goals. Moreover, ongoing projects can be reviewed anytime. Virtual meetings can also be used to train new hires along with remote workers since some virtual meeting providers include features like screen-sharing so employers can directly give the trainees a hands-on experience. They can also opt for conducting classes to further educate the employees. 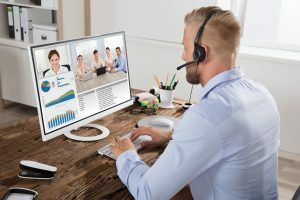 Aside from these, virtual meetings also makes sure that remote employees are able to stay engaged and connected with the workplace. If utilized properly, virtual meetings can play an important role in increasing company productivity and keeping your business in top shape.